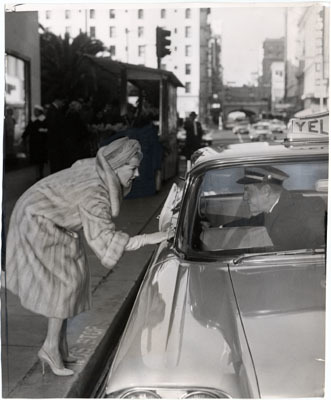 Between 1966 and 1969, the San Francisco Examiner donated two libraries of photographs --what news staff call “morgues”-- to the San Francisco Public Library. The combined gift of the morgues from the San Francisco News and Hearst’s San Francisco Call-Bulletin was an estimated 2 million photographs. The San Francisco News-Call Bulletin Photo Morgue represents the working files created and used by the newspapers’ staff between the 1920s and September 1965. The collection consists primarily of photographs from news agencies and wire services depicting local, state, national and international events and people; filed together with photographs by local staff photographers, studio portraits, and promotional photographs supplied to the newspapers by families or agencies. Political, social, and cultural leaders, crime victims and suspects, celebrities, athletes and sporting events, accident scenes and victims, street scenes, shipping and waterfront views, and buildings are among the common subjects. Upon receipt of the collection, San Francisco places and portraits of local, famous individuals were separated and formed the base of the San Francisco History Subject Collections. There are over 1,200 cartons of photographs in this collection. The majority of the photographic print files remain in their original order, as received by the library. The files that were not broken up and distributed to library subject files are divided into nine series, with an alphabetic code assigned to each series. Five series are from The Call Bulletin and The News-Call Bulletin and four series are the files of The San Francisco News. Since these two groupings represent the files of separate newspapers over a roughly parallel period, there is significant overlap in content. All of the series include interfiled Call Bulletin staff photographs, submitted photographs (studio portraits or promotional photos), and wire or news agency photographs (news wire service photographs include Acme, Associated Press and International News). Approximately 40% of the "People" files and probably up to 90% of some geographic files are from news agencies. Researchers may request for people, places and subjects to be searched in the morgue. There is a guide that breaks down the series - with detailed lists of subjects and famous people (PDF). Please contact the Photo Desk to place your request. As researchers order new scans from the San Francisco News-Call Bulletin Photo Morgue, these selections are cataloged and added to the online database for public access. More details about the collection are on our blog What’s on the 6th Floor?